I am a huge of the TV show Only Fools and Horses. I have watched the episode where they go on the Jolly boys outing to Margate countless times & have always wanted to go on a trip to Margate. We were fortunate enough to be invited by Visit Thanet to come and see and experience some of what the Isle of Thanet has to offer. We made Margate our home for two nights and loved exploring the Thanet Region including Margate, Ramsgate & Broadstairs. There is so much for families to do on the Isle of Thanet. We visited for two nights and whilst we packed a lot in, we have really only just scratched the suface of this most incredible part of the UK. I feel like I could go back for a week and still not fit everything in! I created a little VLOG of our trip which you can watch here: Our Family Trip to Margate, Ramsgate & Broadstairs. We drove down to Margate early Friday afternoon and checked straight into our hotel. We stayed at The Walpole Bay Hotel. The hotel is very quirky, art and quintessentially British; it has an Edwardian charm about it. The hotel houses a Museum and Napery & features many collectable pieces. The hotel has an original 1920’s style working lift with the little grate sliding doors. The hotel immerses you into an arty and historical world. The hotel has a extensive art collection and even houses some exclusive pieces from eminent Margate artist Tracy Emin. The Napery comprises of Napkin Art; created by former guests of the hotel. The Napery includes some fabulous pieces, the ones that stood out for me where; a watercolour painting by a local artist, a note from Tracy Emin and a song written by Ocean Colour Scene. The hotel is frequented by many famous guests. If you enjoy art then then The Walpole Bay Hotel is definitely somewhere you should add to your bucket list. After checking in and unpacking we decided to head to Ramsgate. It was early evening by the time we arrived and we were getting peckish so we decided to go to the newly refurbished Wetherspoons for dinner. The Wetherspoons had beautiful French doors every few metres that literally overlooked the wonderful Ramsgate beach. This was the view we had from our dinner table. Lily & I took a little stroll on the beach while we waited for dinner to arrive. The food was lovely and the portions were huge. We finished dinner just as the Sun was setting over the magnificent Ramsgate Harbour. It was absolutely stunning. After our visit to Ramsgate we headed back to the hotel to get a good nights sleep as we wanted to be up early Saturday and ready to explore. On Saturday morning we had breakfast in our hotel; the choice was quite limited compared to some of the 5* hotels we have visited, but we all found something that we wanted to eat. There was also a good selection of gluten free pastries and dairy free milk so any visitors with allergies would be well catered for. We picked up a Coastal Explorer pack from the Visit Thanet Tourist Information Office in Margate. We then headed to the beach at Broadstairs. The beach at Broadstairs is absolutely stunning and has quickly become one of my favourite UK beaches! It has a beautiful long stretch of golden sand with pretty little beach huts to the rear and is flanked by a huge dominating landscape of white cliffs. We all really loved the Coastal Explorer pack – it was packed full of fun tasks and games to do on the beach and included all the accessories we needed to complete them. We had Binoculars, A Stick, Little Pots, A Microscope, A Compass, A Magnifying Glass, A Fishing Net and the tasks and game suggestions. As a family, excluding the odd sandcastle, we have never really spent much time ‘on the beach’. We go to the seaside regularly but usually either walk along the promenade or go on the rides; the closest we usually get to the beach itself is sitting on the sea wall eating an Ice Cream! We all absolutely LOVED the Coastal Explorer pack; it opened our eyes up to how much fun we could have on the beach beyond just making a sandcastle. 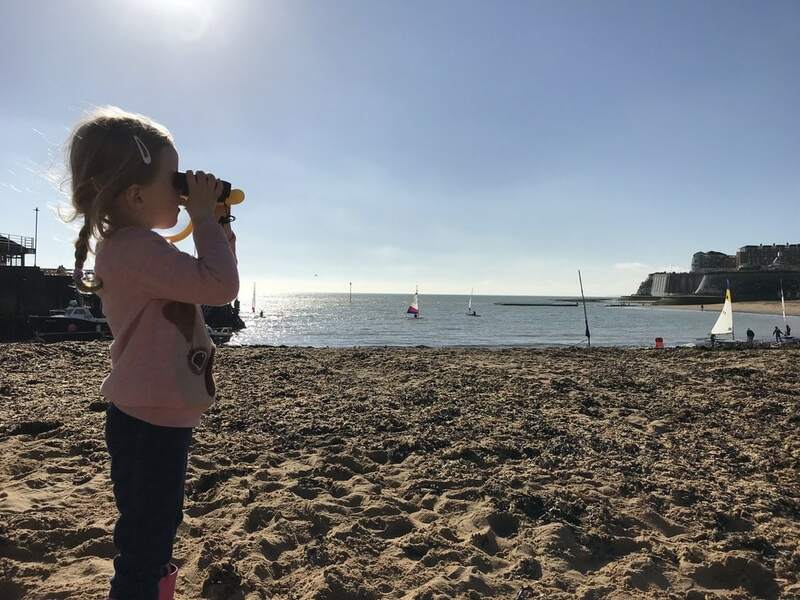 We are really looking forward to doing a Coastal Explorer pack again one day and next time we head to the beach we are going to go armed with fishing nets, crabbing buckets and all sorts – we have been inspired! After playing on the beach at Broadstairs we visited the World famous Morelli’s Ice Cream Parlour! The Ice Cream was amazing. We ate our Ice Cream in the most amazing spot; we sat in Victoria Gardens overlooking the sea; we had the sun shining down on us and it was pure perfection! On Saturday afternoon we headed back to Margate and visited the Paint A Pot pottery studio. Paint A Pot is a wonderful little pottery studio where you choose a piece to paint and then sit down at a table with art supplies provided and paint away to hearts content. The lady who runs the shop is a former teacher and she is brilliant with kids & adults alike. I’m not very good at art but she made me feel very welcome, very relaxed and she gave us some really good tips, help and advice. The studio provide tea and coffee or a soft drink and there is a lovely little selection of snacks to choose from in the shop. Lily painted this really cute little teddy bear. We really enjoyed our session at Paint A Pot and I would definitely do it again. Paint a Pot is a great place for locals as well as tourists as they do pottery painting parties for both children and adults. After our painting session we headed off to find the Tom Thumb theatre. The story of Tom Thumb played such a huge part in Lily’s life. It was the only story that would stop her crying as a baby and her Granddad would walk her around the room for hours telling her it. Seeing the Tom Thumb Theatre was a very special moment. After the Tom Thumb Theatre we headed to Dreamland in Margate to experience all the rides. Mike was keen to go on the Magic Mouse which was designed back in 1957 and as you can see from this video the ride was amazing; Mike really enjoyed all the twists and turns. VIDEO: Magic Mouse Ride Dreamland. I really enjoyed going on the swing ride with Lily; I haven’t been on one of these since I was little! Lily was really brave and went on the little Children’s rollercoaster with Mike. After dreamland we went to buy some fish and chips. We sat in a little park overlooking the sea eating our fish and chips. Lily said “Mummy, this is very wow eating my dinner by the sea”. It was a very special moment. We were lucky to watch the most incredible sunset while eating our dinner. Turner was definitely right when he said that “the skies over Thanet are the loveliest in all Europe”. My only criticism of Margate is that there seemed to be lots of broken glass lying around on some of the coastal paths. After dinner we headed back to our hotel so that we could get a good nights sleep before another fun packed day on the Sunday. Sunday morning we had breakfast in the hotel and then headed to the beach at Margate. 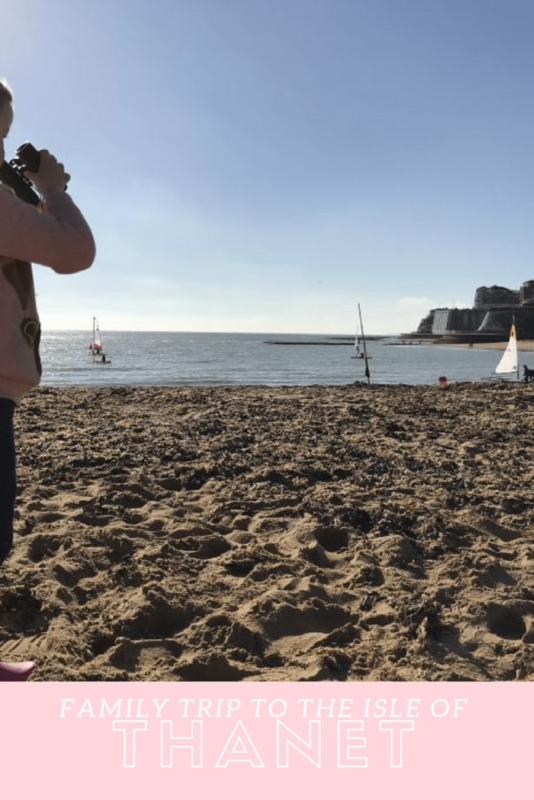 We all loved the Coastal Explorer pack so much the day before in Broadstairs so we decided to do some of the activities in Margate. We collected different types of seaweed. We played hopscotch along the beach. We also went in search of crabs; we found a few crab shells and a crab claw but we didn’t actually find any crabs! After the beach we headed into the Turner Contemporary. We went to see the Arp exhibition and Lily loved looking at all the amazing shapes and seeing how Arp put together the pieces of art. We saw Tracy Emin’s unmade bed. We then headed into the easy like Sunday morning workshop. Lily is really arty and very much enjoyed the workshop. She absolutely loved recreating an Arp piece. The lady who lead the workshop showed Lily how Arp created his random pieces and she was able to do the same. Lily dipped string in some ink and dropped the string onto some coloured paper to create random shapes. Lily then come around the shapes and stuck them onto a plain piece of white card. Lily was so proud of her creation which she called seaside; we thought it was beautiful. We really loved our trip to The Isle of Thanet and we would definitely love to go back again. We had a wonderful trip, but we feel there is so much that we didn’t get chance to see & do. We also can’t wait to re visit Broadstairs; eat Morelli’s and play on the sand with a Coastal Explorer pack. Next time we visit we would also love to explore Ramsgate a little more as we only went there once on this trip. Thanet, we will definitely be back but next time it will be for longer! Disclosure: We were provided with our accommodation, Coastal Explorer packs and Turner Contemporary easy like Sunday morning workshop free of charge in exchange for this review. All opinions remain my own honest, personal ones.